Mayshine Design Non-slip Area Mat makeseveryday safe and comfortable. 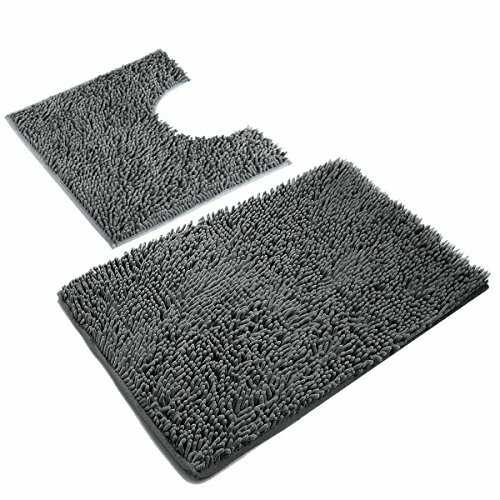 We use microfiber and PVC material of highquality to make this high density and non-shedding thick shaggy rug:Microfibers with 6mm foaminside, soft and plush to the touch; the anti-slip bottom made of PVC reduced the risk of slips and falls.Furthermore, It is particularly durable: After 10 times 6kg-machine wash test by Mayshine,the bath mat is still as good as new. This kind of bottom will not easily fall upafter washing, it has quite long lifetime. Before use:Please dry the floorintended for mat placement. Washinginstructions:Wash coldOnpermanent press cycle with like colorsNon-dryingcleanNon-ironingNon-bleaching Tips:Thedigital images we display have the most accurate color possible. However, dueto differences in computer monitors, we cannot be responsible for variations incolor between the actual product and your screen.Abovesize for manual tile measurement, due to personal measurement technique isdifferent, there may be 1-3 cm error of the physical. Manufacturer'sDescription:Mayshine is alwaysconcentrating on the research and develop of our products in order to let youenjoy a happier and more comfortable life. Color: Turkey Blue Material: Microfiber & Non slip bottom is made of mesh PVC material. Tip: ·Always place mat on a dry surface before use. ·The digital images we display have the most accurate color possible. However, due to differences in computer monitors, we cannot be responsible for variations in color between the actual product andyour screen. ·Above size for manual tile measurement, due to personal measurement technique is different, there may be 1-3 cm error of the physical. Washing instructions: ·Wash cold ·On permanent press cycle with like colors ·Non-drying clean ·Non-ironing ·Non-bleaching ·Suitable for underfloor heating Packing description: 1 x Bath Rug 1 x Instructions Manufacturer's Description： We design this product mainly for the bathroom. When you bathe out, step on the rug, you will feel very comfortable and it will dry your feet quickly. Cause we chose the microfiber material and we use PVC material for the back surface. It has better slip resistance and no odor. We offer 7 sizes and 8 colors combinations for you to choose and hope you can get the favorite products. Mayshine is always concentrating on the research and development of our products in order to let you enjoy a happier and more comfortable life. 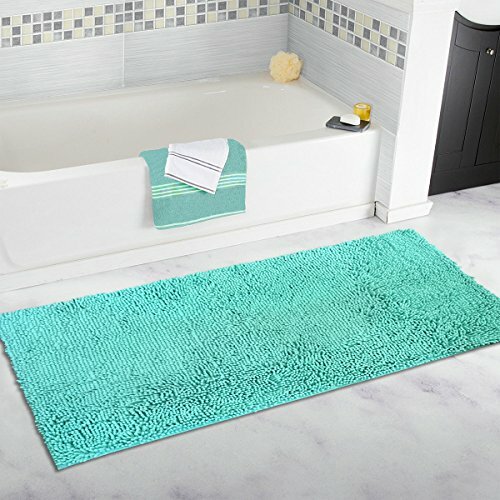 Bring comfort and style into your bathroom with this Uphome Moroccan Bathroom Rug. The moroccan pattern adds fun and flair, livening up most any space. This Uphome rug is soft to the touch and constructed to absorb water quickly. 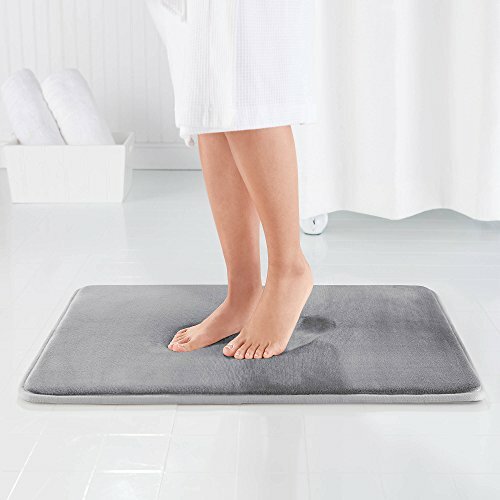 It is made of 100 percent microfiber polyester, making it soft on your feet, and it features a non-skid, no-slip backing for helping keep it in place as you towel dry. This rug is machine washable for easy care. 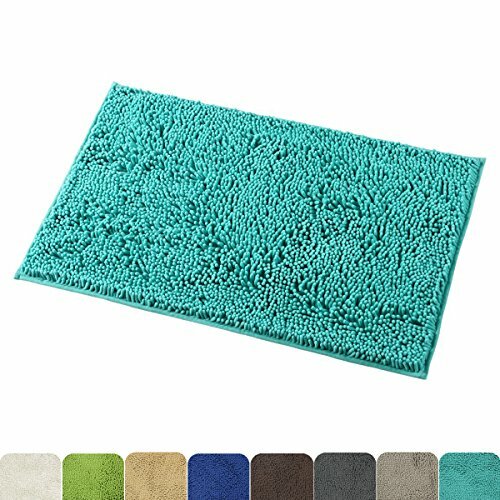 Use the versatile Uphome Microfiber Rectangular Moroccan Rug in the bathroom, kitchen, office, or bedroom. Size : 18"W x 48"L (45 x 120 CM) Pattern: Moroccan pattern Material: 100% microfiber polyester and anti-slip rubber backing Care Instruction : Machine washable Perfect for front door, back door, kitchen, bathroom, bedroom, living room, dining room, office, porch, stairs, balcony, etc. This product is designed and sold exclusively by Uphome. Only buy from Uphome to get genuine Uphome(TM) products with manufacturer warranty and superb customer service. 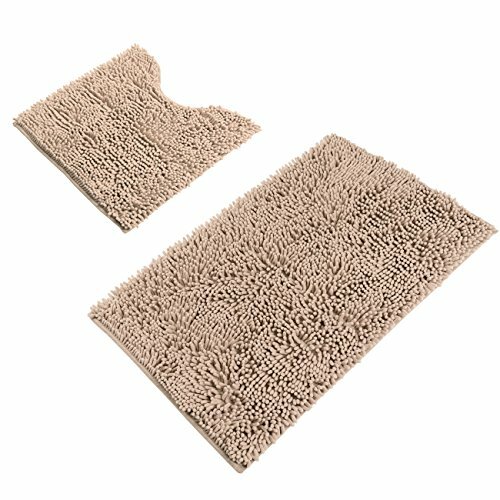 The Chardin Home contemporary bath mat set (set of 2) is a set of essential bathroom rugs that do not compromise on style for the sake of functionality. 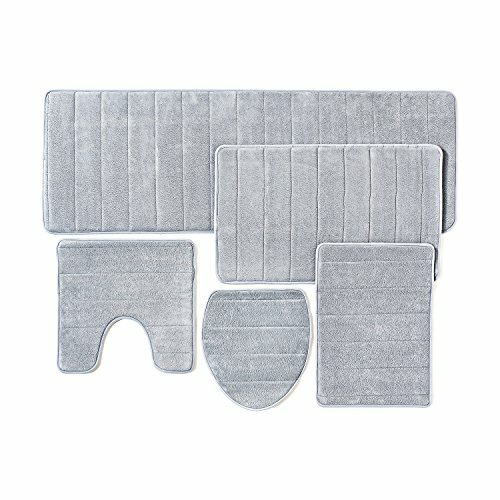 The rugs in this set are made from 100% pure cotton. This helps in complete absorption of any water spill. It features anti-skid latex backing that prevents the rug from slipping. 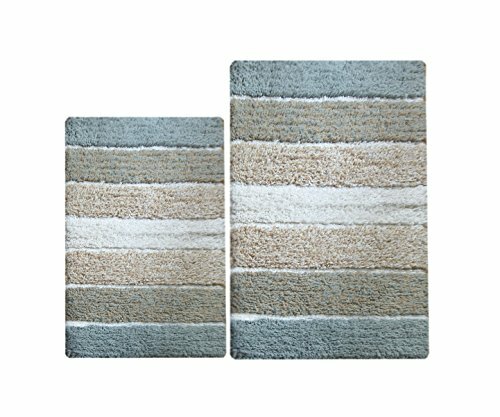 These contemporary bath rug set from Chardin is made with precision and its distinctive tufting provides for elevated patterns which are very soft to touch. These comfortable rugs are foldable, making them easy to store in compact spaces. 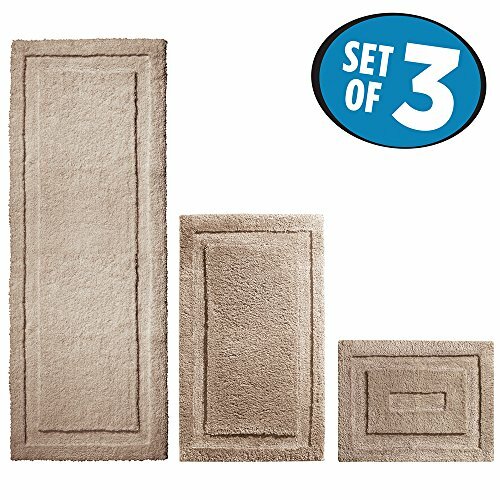 Each set contains two rugs of different sizes. Both the rugs are rectangular in shape and can help accentuate the look of your bathroom, without compromising utility. These rugs are to be washed in the machine with cold water separately on a gentle cycle. Drying these rugs requires a tumble dry low setting so as to not harm their distinctive texture. Are you looking for the Best Bathroom Rugs. We spent hours to find out the Best Bathroom Rugs for you and create a review video. In this video review you will find the top products list, what is the feature of these products and why you should buy it. 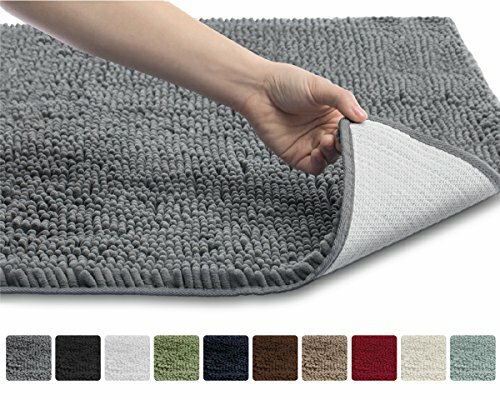 Compare prices on Rugs For Bathroom at ShoppinGent.com – use promo codes and coupons for best offers and deals. Start smart buying with ShoppinGent.com right now and choose your golden price on every purchase.